Words have power. We use them every day without thinking about it, but they shape us as much as those around us. Words can inspire, sway, or depress others. In Alice 19th, the strength of the spoken word is key, and the 24 words of power wielded by a Lotus Master are particularly potent. Alice, the main character of this story, isn't exactly the person you'd think about when contemplating the power of speech. She barely ever talks, seemingly content with living under the shadow of her older sister, Mayura. Her fellow students don't pay much attention to her, but that's fine by Alice. She doesn't want to make trouble for others, finding it easier to slip by unnoticed than to make people aware of her. However, when her sister disappears and she's suddenly spending far more time with Mayura's popular boyfriend, Kyo (as well as kind, good-looking, intelligent, and athletic), she's suddenly in the public eye. More disturbing than her newfound notoriety and the disappearance of her sister is the manner in which Mayura vanished. After an uncharacteristically virulent argument between the two siblings, Alice told her sister to "Just disappear." It was then that Alice realized the significance of her words. She finds out that she has the potential to become a Lotus Master, one whose every word carries physical implications. When she told her sister to disappear, that was taken as a command, and so it occurred. In this parallel version of modern-day Japan, there is a dark force - Mara - threatening to consume mankind. Feeding off the negative energy produced by fear, hatred, jealousy, and other human shortcomings, Mara is the antithesis of life itself. Use of the Lotus Words - an inherited trait, apparently - is one of the only ways of combating Mara on its own turf, known as the Inner Heart. In this volume, we learn more about another young user of the Lotus Words, Frei. The young foreigner is a little too attracted to Alice for propriety's sake, but impressively adept when it comes to battling Mara. With his help, and the aid of Kyo, there's a chance that Alice may yet bring back her sister - before it's too late. As usual, Yu Watase has crafted a story containing believable characters that rise to the occasion in extraordinary circumstances. This series remains realistic despite the overt slant toward the fantastic, and I can't wait to see where the author takes it. Also as can be expected, although there is a dire situation present here, there's plenty of humor to take the edge off of what could've been a far more depressing story. It's not easy to lighten up a tale about the abduction of a young girl by a dark mystical force, - intent on the destruction of all humans, no less - but Watase pulls it off with grace. For some of us, the author's artistry alone is worth the price of admission. 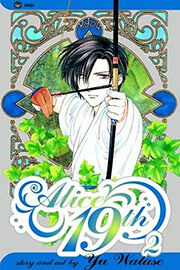 The look of Alice 19th differs in subtle ways from her other works. There is a more delicate use of shading (possibly computer-aided), and every once in a while, she'll emphasize a character by outlining him or her with a bold black line. It works well as a dramatic device. Viz chose to bring this book over in a form that makes me, at least, pretty happy. It's unflipped, and not only does Watase's sound effects remain intact, but there's also a super handy translation guide in the back of the book. It's in Viz's new smaller format, but it's also less expensive than the manga titles of yore. I just hope this price-reducing trend continues. Well, I can dream, at least. So, here we have it. Or, rather, here I have it. Shojo, the way it ought to be. Nothing too frilly, plenty of action, and an engaging romantic tale tucked in for good measure. And if you don't have it...you should probably get it.